I recently went to a taping in Hollywood of a new pilot show called “The Guest Room” hosted by Rich Eisen. Sports fans know Rich Eisen from his years as a broadcaster with ESPN, CBS, and most recently NFL network. Waiting in line outside the studio, most of the 75 or so people assumed we were going to see a sports talk show, but we were in for a great surprise. It was a quick taping, but very entertaining. We were led inside to a simple studio. There was a comfy chair for the host, and one for his guest. The design was sort of like a “man cave”, with sports memorabilia, a miniature pool table, and movie posters. As more guests arrived (there were three total), more chairs were added. With little guesses as to whom the show guest would be, the audience warm-up host Gary let the cat out of the bag telling the audience that the special guest was Adam Sandler. We were happily surprised. Sure enough, after a few minutes with the warm up guy, Rich came out and said hello, and introduced a Yankees jersey wearing Sandler to the roar of the small but excited audience. It was great hearing Adam joke about what its like to live with a house full of women, being a student at NYU, his big break as a young actor on “The Cosby Show”, and that famous scene with Bob Barker in “Happy Gilmore”. After a segment with Sandler, his long time friend and collaborator Allen Covert joined the two. 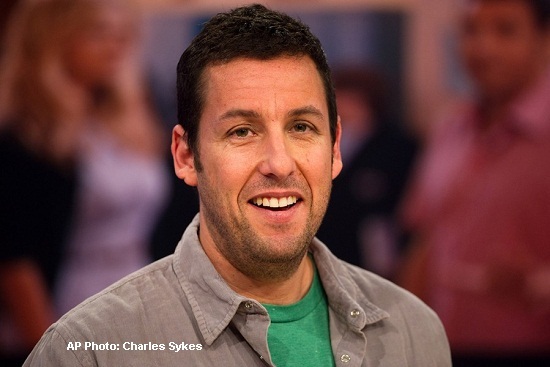 We found out Covert has been in over twenty of Sandler’s movies. He had some great stories about the good old days as Sandler’s friend at NYU, and the “history of comedy” class where the two met. The third “surprise” guest was Kevin Nealon, who just sprang-up out of the audience. Nealon was hilarious, telling great stories about the Saturday Night Live days with Sandler. We even got to see some classic SNL sketch photos. Overall, the show was great, mostly in part to the great guests. Eisen has a relaxed demeanor, and Sandler and company were funny, but not over the top. One mystery is, (if the show is picked-up), can Eisen make a non-superstar guest interesting. Or can he consistently book top notch talent like Adam Sandler as his guests? It was also surprising that not once did they talk about sports, considering Eisen’s sports hosting background. I hope to see it on television soon.